This data set consists of a 1:2.5 million scale forest cover map for the land area of the Former Soviet Union (FSU) that was completed in 1990 (Garsia 1990). There are forty-five classes distinguished in this data set, thirty-eight of which are forest cover classes. The purpose of this map was to create a generalized and up-to-date map of forest cover for the USSR. This map should be viewed not as a detailed forest cover map but as an economic forestry map. The most important tree species of a region are highlighted rather than the dominant trees species or tree cover. Very few tree species are defined. In many cases, of course, the dominant and the most important trees species are the same. In addition, the map bears a very strong resemblance to the 1973 Forest Atlas (Anon. 1973), so there is concern that this map is based on a 1973 Atlas, which was likely based on forestry data from the 1940s, 1950s, and 1960s. This 1990 map appears more simplified than the Forest Atlas of 1973. The data are provided in several formats, including binary raster data in Idrisi format, ASCIIGRID raster data in ASCII format (easily imported into ArcInfo), vector data in ArcView shapefile format, and a graphic map in JPEG format (see Figure 1.). Please read all documentation before using these files. Figure 1. Forest Cover Map for the Land Area of the Former Soviet Union. Stone, T. A., and P. Schlesinger. 2003. RLC Forest Cover Map of the Former Soviet Union, 1990. Data set. Available on-line [http://www.daac.ornl.gov] from Oak Ridge National Laboratory Distributed Active Archive Center, Oak Ridge, Tennessee, U.S.A. doi:10.3334/ORNLDAAC/691. This data set consists of a 1:2.5 million scale forest cover map for the land area of the FSU. Forty-five land cover classes are distinguished. The map bears a very strong resemblance to the 1973 Forest Atlas (Anon. 1973), so there is real concern that this map is based on a 1973 Atlas, which was likely based on forestry data from the 1940s, 1950s, and 1960s. The 1990 map appears more simplified than the Forest Atlas of 1973. LAND COVER footnote: See Land Cover Classes above. Please read all documentation before using these files: http://daac.ornl.gov/daacdata/russian_land_cover/forest_map_1990/comp/fmap90_readme.txt and http://daac.ornl.gov/daacdata/russian_land_cover/forest_map_1990/comp/fmap90_projection.txt. A binary raster image depicting forest cover (Garsia 1990) in Idrisi format made up of 8212 columns by 4548 rows comprising 8-bit bytes. Note: must be converted to an *rst file when using version 3.2 of Idrisi. Use the Idrisi File Conversion (16/32) utility available in the file pulldown menu to convert to the new format. Also note that the Idrisi v. 2 image documentation file, fmap90.doc, MUST be present for the binary data to be read by Idrisi. Compressed ASCIIGRID version of the binary raster data (fmap90.img). This data file was created by converting the Idrisi binary file (fmap90.img) using Idrisi export utilities. Vector map version of data (same info as raster data fmap90.img and fmap90.asc.gz) in ArcView shapefile format (compressed). Regional-, national-, and sub-national-level forest and land use change assessments. The source vector data for the raster version of the 1990 Forests of the USSR (being distributed here) were obtained from the World Conservation Monitoring Centre (WCMC) as an ArcInfo Export format file (World Wide Fund for Nature and WCMC 1996). These data were reprojected from geographic projection to Lambert Azimuthal Equal Area using ArcInfo for UNIX using the PROJECT command. The subsequent coverage was also gridded using this software, and these data were exported to a generic binary format suitable to Idrisi v. 2.0 for Windows. 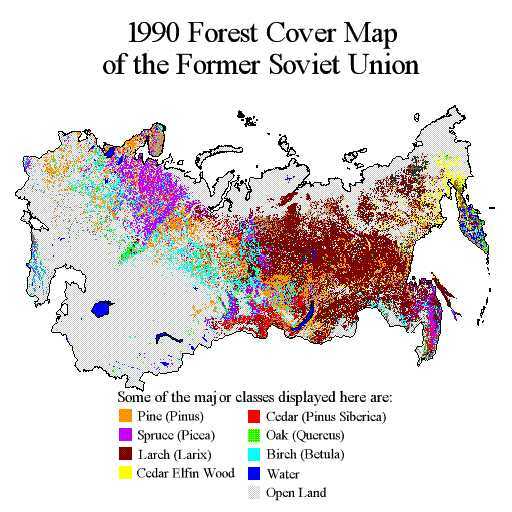 Stone and Schlesinger (1993), "Translation of the Legend of the 1990 Map "Forests of the USSR," is included as a companion file [http://daac.ornl.gov/daacdata/russian_land_cover/forest_map_1990/comp/fmap90_legend-4.pdf]. This map should be viewed not as a forest cover map but as an economic forestry map. The most important tree species of a region are highlighted rather than the dominant trees species or tree cover. Very few tree species are defined. Generally, each polygon and color has one tree species assigned to it. In many cases, of course, the dominant and the most important trees species are the same. In addition, the map bears a very strong resemblance to the 1973 Forest Atlas (Anon. 1973), so there is concern that this map is based on a 1973 Atlas, which was likely based on forestry data from the 1940s, 1950s, and 1960s. The 1990 map appears more simplified than the Forest Atlas of 1973. There are no indications of land covers other than forests and there are no indications of forestry or logging activity. Some larger burn areas are noted. Hence, like all maps of this scale, the map is generalized. It is not recommended that the map be used at a scale more detailed than 1:2,000,000. As in other maps, the polygons are discreet entities, tree species categories do not blend into one another. In nature, vegetation types and forms tend to go through gradual transitions from one group of plant species to another. This gradual transition is lost in cartographic products when a line is drawn that separates two units of land cover. Maps that are produced from satellite data are generally raster products that do not define well-bounded polygons and, in a sense, may be more representative of nature. Coastline and great inland lakes in the data set correspond to those found in the Digital Chart of the World (ESRI 1993). The source data were acquired from World Conservation Monitoring Centre (previously http://www.wcmc.org.uk; now http://www.unep-wcmc.org). Users of these data agree to notify WWF Russian Programme Office (chestin@wwfus.glasnet.ru) and agree to acknowledge the source of data as follows: Source: WWF Russian Programme Office, Moscow, with support from WWF US and the World Conservation Monitoring Centre, coordinator Dr. I. Lysenko. Data are available electronically on the ORNL DAAC's anonymous HTTP site or from the DAAC's search and order system. Data files are also available by request from uso@daac.ornl.gov. Anon. 1973. Atlas of Forests for the Soviet Union, Main Geodetic and Cartographic Organization for the Ministries of the USSR, Moscow, 222 pp. Garsia, M. G (ed.). 1990. Forests of the USSR, Scale 1: 2,500,000, Forest Cartography Department of All-Union State Planning - Research Institute Sojuzgiprolezhoz. GUGK, Moscow, USSR. Stone, T. A., and P. Schlesinger. 1993. Translation of the Legend of the 1990 Map "Forests of the USSR." A report to the Northeast Forest Experiment Station, USDA Forest Service, Global Change Research Program, Radnor, Pennsylvania [http://daac.ornl.gov/daacdata/russian_land_cover/forest_map_1990/comp/fmap90_legend-4.pdf]. World Wide Fund for Nature and WCMC, 1996. The Digital Forest Map of the USSR, version 2.0, completed 12-20-95. World Wide Fund for Nature, World Conservation Monitoring Centre, Cambridge. ESRI. 1993. Digital Chart of the World (DCW).